It may be early in Evgeni Malkin’s career, but NHL goaltenders are starting to fear the young Russian whenever he touches the puck. When his family is in attendance – look out goalies. Malkin scored for the third-straight game to help the Penguins defeat the Blue Jackets, 5-3, at Mellon Arena with Malkin’s family in the crowd. “Geno” has scored a goal in all three games played since he made his NHL debut Wednesday night against New Jersey. According to Elias Sports Bureau, the last rookie to score a goal in his first three NHL games was Jan Caloun, who tallied in his first three games with the San Jose Sharks in the 1995-96 season. “Of course, I didn’t know that was going to happen. 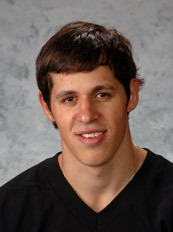 I still have to adjust to a different way they play hockey over here,” Malkin said through translator George Birman. “It’s a little bit different and I am not doing everything the coach is telling me to do. One thing Malkin was sure of, however, was that the Penguins were going to beat Columbus since his parents, Vladimir and Natalia, and brother, Denis, were in attendance at Mellon Arena. Once again, Sidney Crosby set up Malkin for a goal. It came 7:04 into the third period when the duo worked its power-play magic. Crosby slid a pass to Malkin, who rifled it past goaltender Fredrick Norrena. The Penguins’ last three first-round draft picks: Jordan Staal, who scored two short-handed goals Saturday, Crosby and Malkin continue to contribute for the Penguins.